That’s what today’s dish is allll about. Pure, unadulterated, completely unapologetic DECADENCE. As if pasta carbonara wasn’t enough of a “treat,” I had to go all cray-cray and load it up with burrata cheese. Yup. I know I’ve said this 14 times too many on this blog, but…sorry I’m not sorry. Hey, at least most of us don’t have to worry about wearing a bathing suit anytime soon, right? 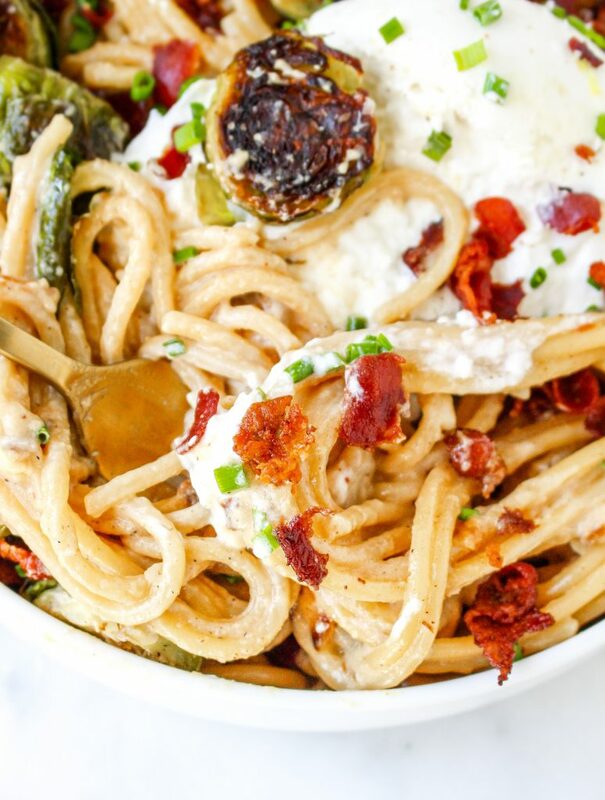 This carbonara is special for many reasons. Obviously, burrata (which my autocorrect ALWAYS changes to “burrito”) is the first thing to come to mind. The creamy center is enough to make me lose my mind. 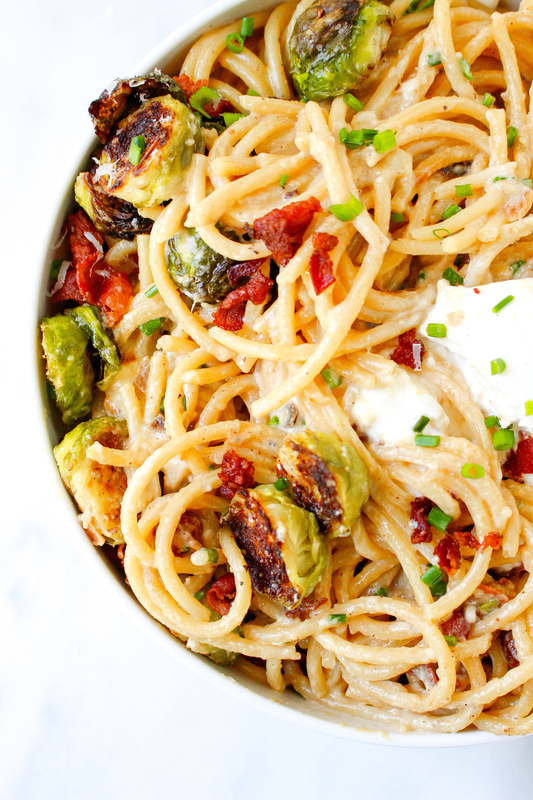 The way it coats pasta strands once it’s been cut into is just….well…it’s the stuff dreams are made of. Food dreams, that is. 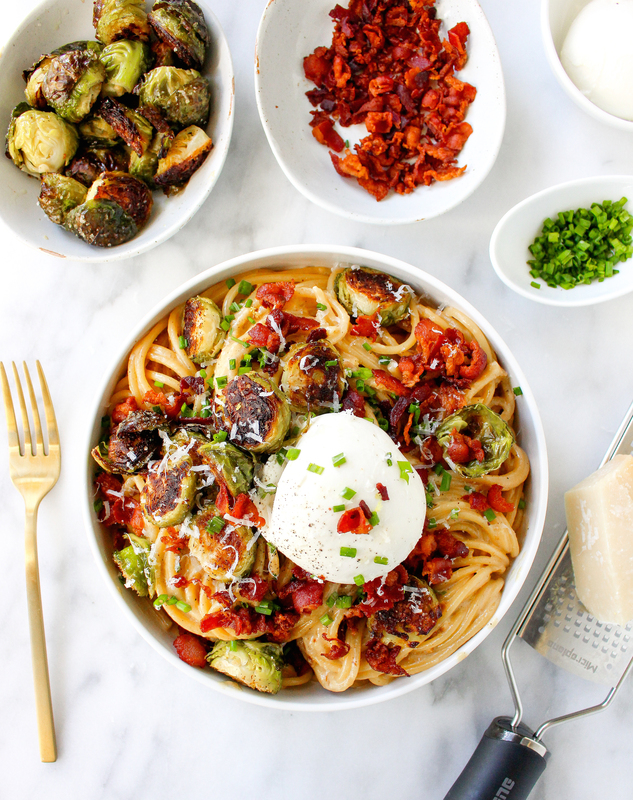 The others include crispy, roasted brussels sprouts, crispy bacon bits, and a caramelized onion/gruyere-based cream sauce. I’m drooling just writing it out. It’s just…BEYOND. 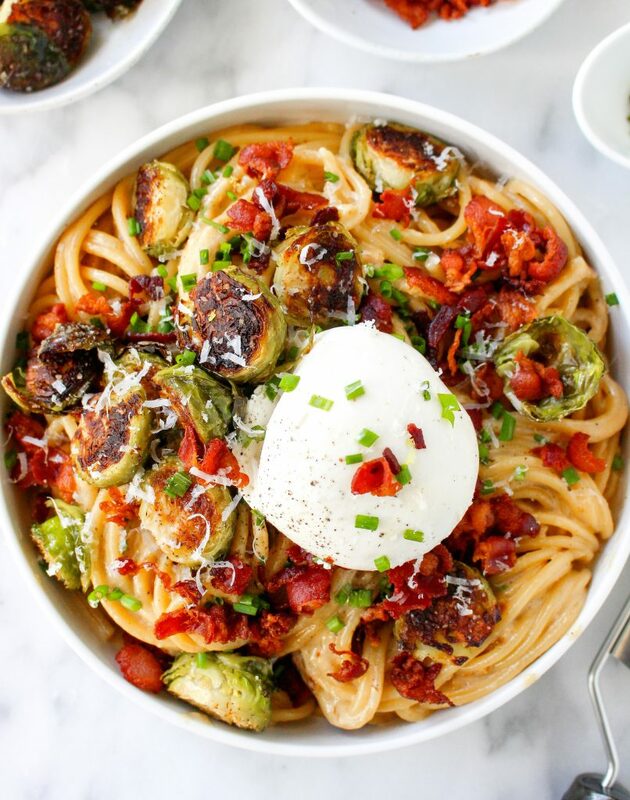 I have made a version of this dish for a few years now, usually when we had something to celebrate or felt like overindulging with a bottle of two of wine (because, let me tell ya, this pasta goes heavenly with wine) on a quiet Saturday night. 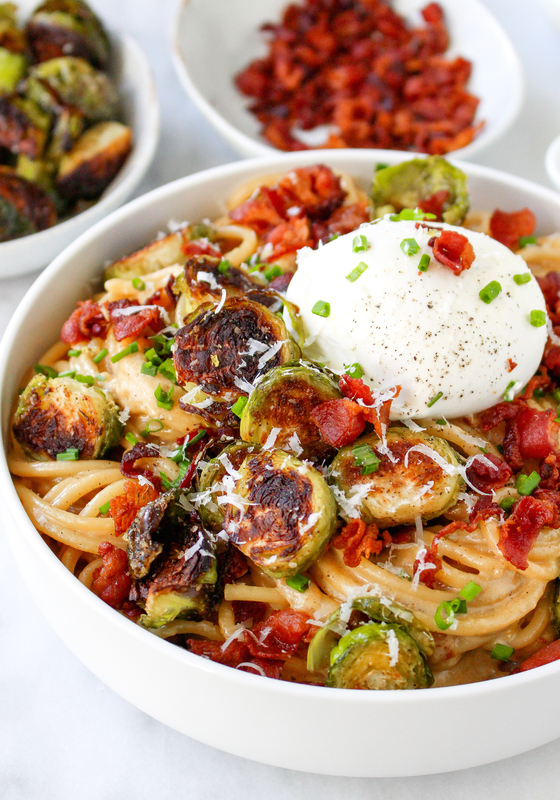 Carbonara is pure comfort food, and when you want to make something special (or if you’re a semi-emotional eater like me and need a food hug every now and then, haha), then pull out your stretchy pants, folks. Covered in one of the best (no, really!) cheese sauces to ever exist. Buttery, sweet caramelized onions that are cooked in bacon fat (shall I fake apologize again?) get whisked right into the cream sauce. Loads of gruyere and parmesan cheeses make this one a total flavor bomb. As if the roasted brussels sprouts and bacon wouldn’t be enough flavor all on their own. 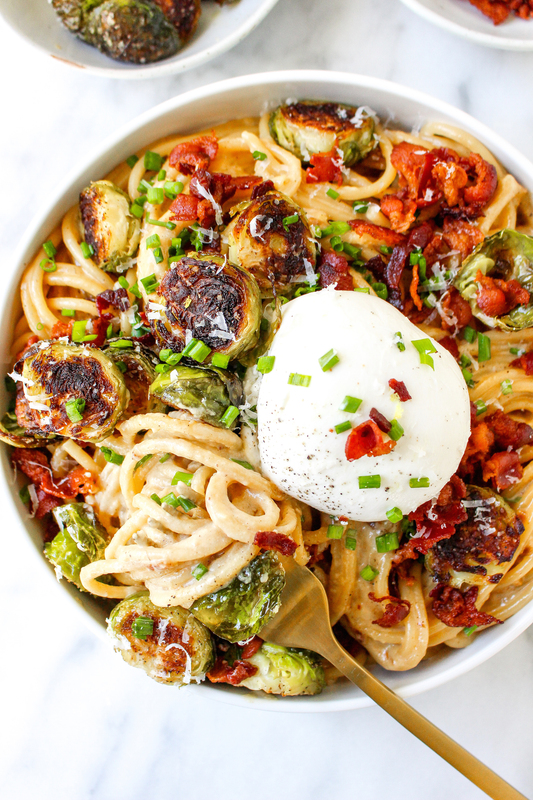 Or the perfectly el dente bucatini pasta. Gosh, there is just so much to love here. It’s hard to narrow down my favorite part of this dish. It is yummy from top to bottom. Sure, you may have to run an extra few miles the next day to sweat out all the wine and cheese, but it’s worth it. Come on. Dive on into that pile of love right there. Swim through the noodles with me. You know you wanna. Say it with me this time: I’m sorry I’m not sorry. Preheat the oven to 425°F and line a baking sheet with foil. Spread the brussels sprouts out in an even layer on the sheet and drizzle with a few teaspoons of olive oil. Season with salt, pepper, and the red pepper flakes. Toss to evenly coat. Roast for 25-30 minutes, shaking the pan occasionally, or until the brussels sprouts are tender and caramelized/charred in spots. While the brussels sprouts are roasting, bring a large pot of water to a boil. Crisp the bacon in another large pan and then remove and set aside (save it for garnish). Reduce the heat to medium. To the drippings in the pan, add the onion and cook for 5 minutes until softened. Add in the garlic and cook over medium-low heat for 10 minutes, stirring frequently, or until the onions are golden and caramelized. Meanwhile, cook the pasta in the boiling water until it is el dente. Drain, reserving 1 cup of the pasta water, and set aside. 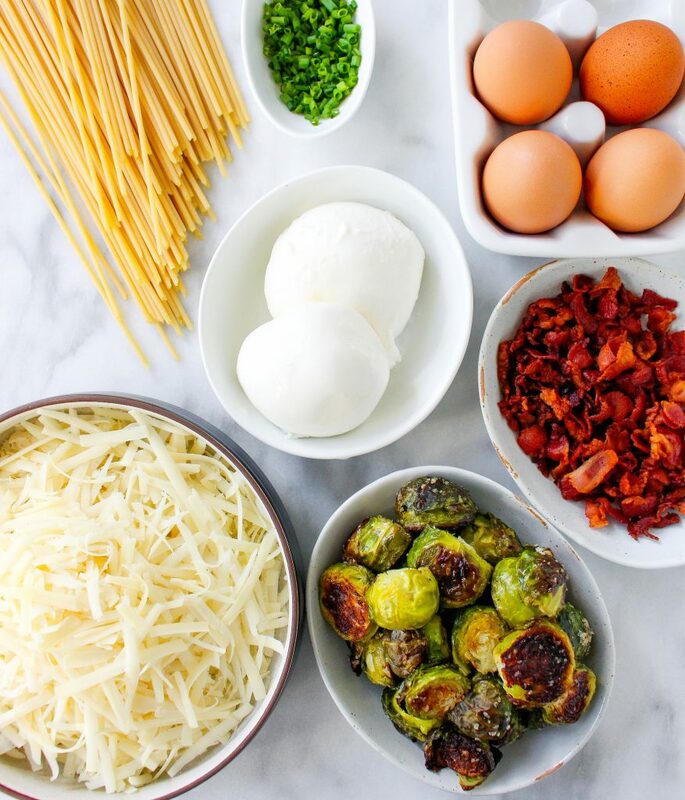 Whisk the cream, eggs, lemon zest, and cheeses together in a bowl. Season with a little salt and pepper. Reduce the heat of the onion pan to low and whisk in the cream mixture. Add the pasta and half of the reserved pasta water and toss to coat in the sauce. Continue to stir and toss everything together for a few minutes until the sauce thickens and coats the noodles, adding more pasta water as needed to thin it out. The idea is for the sauce to be creamy and silky and thoroughly coating the noodles. It may take several minutes of stirring and tossing to achieve this consistency. Stir in the chives at the last minute and then check the seasoning, adjusting as necessary. 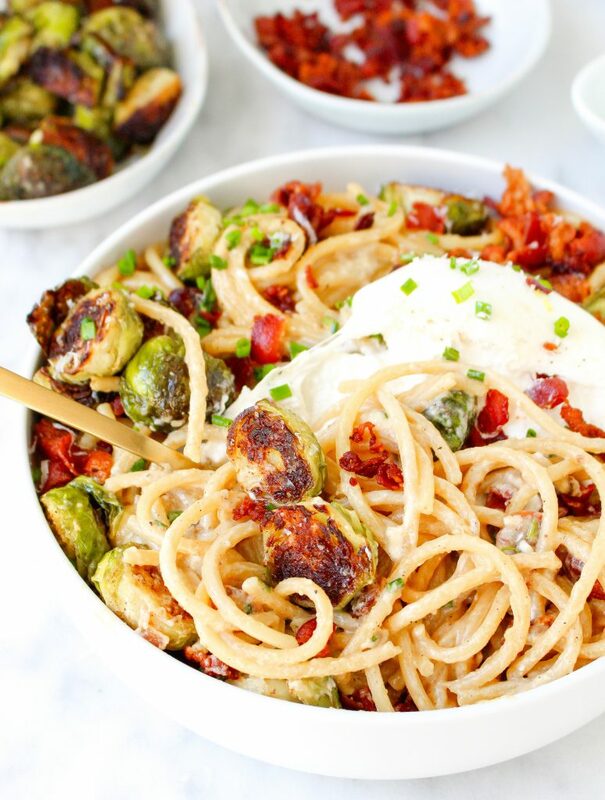 Divide the pasta between serving bowls and top each with the roasted brussels, crispy bacon, additional chives, and additional grated parmesan. For an extra decadent treat, top each bowl with some of the burrata cheese. Serve immediately. Sauce lightly adapted from here. I’d eat my monitor if it had burrata on it. Sorry? Not. This looks just too dang divine for words. Happy New Year. Thanks, Lizzie! 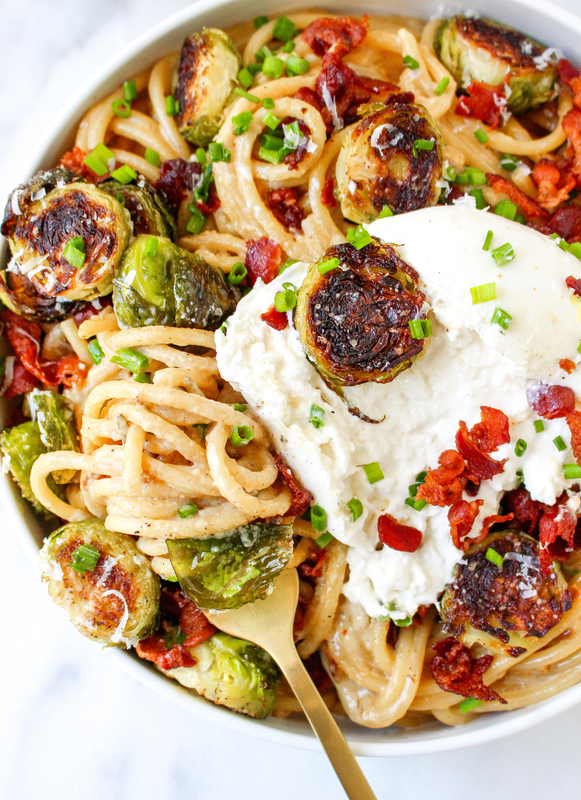 I’m with ya on the burrata. This looks yummy! One question, in the instructions, you say to whisk together cream, milk, etc., but there is no listing for how much milk to use n the ingredients list. How much milk should I use, or is that just a typo? Oh gosh, totally a typo! Sorry about that. Fixing it now!